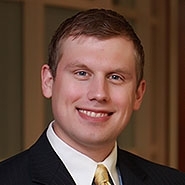 Lewis Rice associate Joseph E. Bant was recently accepted to the Kansas City Metropolitan Bar Association (KCMBA) Bar Leadership Academy. This institution is designed to facilitate the development of emerging leaders of the legal profession in the Kansas City area. The Academy Planning Committee selects attorneys representing diverse geography, race, gender, and private/public law practice. The curriculum of leadership training ensures that graduates of the Academy will have the skills and passion to excel at leadership positions in bar associations, community and civic organizations, law firms, and judicial and public service entities. Lewis Rice congratulates Joe on his acceptance. In his litigation practice, Joe represents businesses and individuals in a broad array of civil disputes in state and federal courts. He regularly handles wage and discrimination claims, contract disputes, non-compete agreements, secured transations, consumer protection claims, and matters in appellate litigation. Joe is also an active participant in recruitment for the Kansas City office.